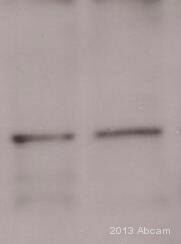 This antibody does not detect caveolin-1 or -2. Synthetic peptide corresponding to Mouse Caveolin-3 aa 1-19. WB: Rat heart, mouse heart, rat skeletal muscle, rat cardiac muscle and mouse muscle tissue lysates. ICC/IF: HeLa, A-375 and C2C11 cells. IHC-P: Mouse heart, lymph node and skeletal muscle tissue sections. IP: Mouse heart tissue lysate. Flow Cyt: U-87 MG cells. Our Abpromise guarantee covers the use of ab2912 in the following tested applications. WB Use a concentration of 1 - 3 µg/ml. Can be blocked with Mouse Caveolin-3 peptide (ab4930). Blocked with 5% skimmed milk. Immunocytochemistry/Immunofluorescence analysis of Caveolin-3 in HeLa Cells. Cells were grown on chamber slides and fixed with formaldehyde prior to staining. Cells were probed without (control) (right panel) or with ab2912 at a dilution of 1/20 overnight at 4°C, washed with PBS and incubated with a DyLight-488 conjugated secondary antibody. Caveolin-3 staining (green), F-Actin staining with Phalloidin (red) and nuclei with DAPI (blue) is shown. Images were taken at 60X magnification. Immunohistochemistry was performed on normal biopsies of deparaffinized mouse heart tissue. To expose target proteins heat induced antigen retrieval was performed using 10mM sodium citrate (pH6.0) buffer microwaved for 8-15 minutes. Following antigen retrieval tissues were blocked in 3% BSA-PBS for 30 minutes at room temperature. Tissues were then probed at a dilution of 1/200 with a rabbit polyclonal antibody recognizing Caveolin-3 ab2912 or without primary antibody (negative control) overnight at 4°C in a humidified chamber. Tissues were washed extensively with PBST and endogenous peroxidase activity was quenched with a peroxidase suppressor. Detection was performed using a biotin-conjugated secondary antibody and SA-HRP followed by colorimetric detection using DAB. Tissues were counterstained with hematoxylin and prepped for mounting. 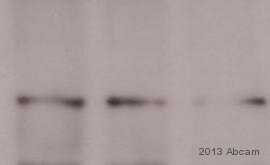 Caveolin-3 was immunoprecipitated using 5 µg of ab2912 from mouse heart tissue lysate (Lane 3) using the protein A beads. Normal rabbit IgG was used as a isotype control (Lane 2). 10% input represents the cell extract used for immunoprecipitation (Lane 1). 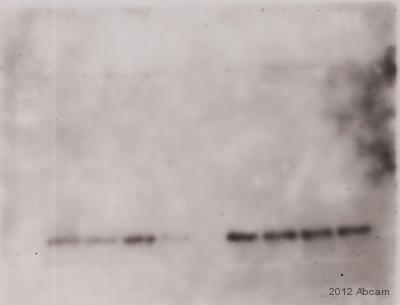 Western blot analysis was performed using ab2912 and HRP-conjugated goat anti-rabbit IgG (H+L) at a dilution of 1/2500. Chemiluminescent detection was performed. Flow cytometry analysis of U-87 MG cells. Cells were fixed with 70% ethanol for 10 minutes, permeabilized with 0.25% Triton X-100 for 20 minutes, and blocked with 5% BSA for 30 minutes at room temperature. Cells were labeled with ab2912 (red histogram) or with rabbit isotype control (pink histogram) at 3-5 ug/million cells in 2.5% BSA. After incubation at room temperature for 2 hours, the cells were labeled with Alexa Fluor® 488-conjugated goat anti-rabbit secondary antibody at a dilution of 1/400 for 30 minutes at room temperature. The purple histogram represents unstained control cells and the green histogram represents no-primary-antibody control. Immunofluorescent analysis of Caveolin-3 in C2C11 Cells. Cells were grown on chamber slides and fixed with formaldehyde prior to staining. 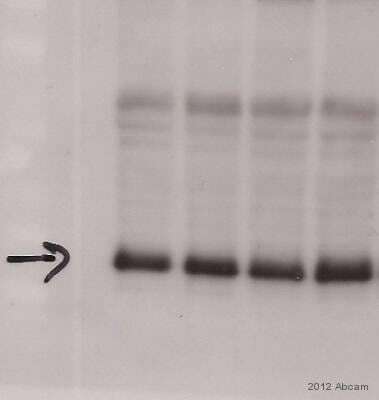 Cells were probed without (control) (right panel) or with ab2912 at a dilution of 1/20 overnight at 4 C, washed with PBS and incubated with a DyLight-488 conjugated secondary antibody. Caveolin-3 staining (green), F-Actin staining with Phalloidin (red) and nuclei with DAPI (blue) is shown. Images were taken at 60X magnification. Immunohistochemistry was performed on normal biopsies of deparaffinized Mouse skeletal muscle tissue. To expose target proteins heat induced antigen retrieval was performed using 10mM sodium citrate (pH6.0) buffer microwaved for 8-15 minutes. Following antigen retrieval tissues were blocked in 3% BSA-PBS for 30 minutes at room temperature. Tissues were then probed at a dilution of 1/100 with a rabbit polyclonal antibody recognizing Caveolin-3 ab2912 or without primary antibody (negative control) overnight at 4°C in a humidified chamber. Tissues were washed extensively with PBST and endogenous peroxidase activity was quenched with a peroxidase suppressor. Detection was performed using a biotin-conjugated secondary antibody and SA-HRP followed by colorimetric detection using DAB. Tissues were counterstained with hematoxylin and prepped for mounting. Immunohistochemistry was performed on normal biopsies of deparaffinized mouse lymph node tissue. To expose target proteins heat induced antigen retrieval was performed using 10mM sodium citrate (pH6.0) buffer microwaved for 8-15 minutes. Following antigen retrieval tissues were blocked in 3% BSA-PBS for 30 minutes at room temperature. Tissues were then probed at a dilution of 1/200 with a rabbit polyclonal antibody recognizing Caveolin-3 ab2912 or without primary antibody (negative control) overnight at 4°C in a humidified chamber. Tissues were washed extensively with PBST and endogenous peroxidase activity was quenched with a peroxidase suppressor. Detection was performed using a biotin-conjugated secondary antibody and SA-HRP followed by colorimetric detection using DAB. Tissues were counterstained with hematoxylin and prepped for mounting. Immunocytochemistry/Immunofluorescence analysis of 70% confluent log phase A-375 cells. Cells were fixed with 4% paraformaldehyde for 15 minutes, permeabilized with 0.25% Triton X-100 for 10 minutes, and blocked with 5% BSA for 1 hour at room temperature. Samples were incubated with ab2912 at 1µg/ml in 1% BSA for 3 hours at room temperature and then labelled with Alexa Fluor® 488-conjugated goat anti-rabbit IgG (H+L) at a dilution of 1/2000 for 45 minutes at room temperature (panel a: green). 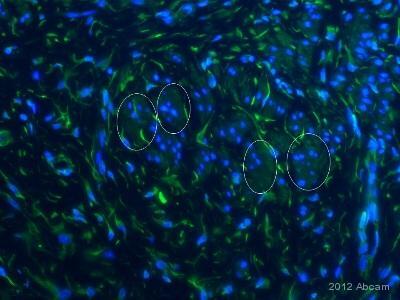 Nuclei (panel b: blue) were stained with DAPI. F-actin (panel c: red) was stained with Alexa Fluor® 555 Rhodamine Phalloidin (1/300). Panel d is a merged image showing cytoplasmic localization. Panel e is a no primary antibody control. The images were captured at 60X magnification.